Its offices have been firebombed, its website hacked, its Facebook page suspended for 24 hours and its staff targeted with death threats, so you might have thought the French satirical magazine Charlie Hebdo would have tried – just for a while – to avoid upsetting anyone. Mais non! 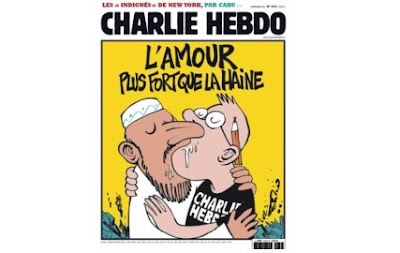 After provoking all the above with last week's special edition "guest edited" by the prophet Muhammad, entitled Charia Hebdo, which took pot-shots at radical Islam, the publication is set to raise a few more hackles with this week's edition, published on Wednesday. On the front page of the latest edition is a drawing of a male Charlie Hebdo cartoonist passionately kissing a bearded Muslim man, under the headline: L'Amour plus fort que la haine (love is stronger than hate). In the background of the cartoon, signed Luz, are the ashes of the magazine's offices, completely destroyed in the Molotov cocktail attack last week.